"Intensive moisturising treatment. Counteracts the signs of tiredness and refreshes the skin for a bright and radiant complexion. With Vitamin C, Camu-Camu, Orange and Acerola Fruit Extract. Stress, poor air quality, overheated rooms and a lack of sleep can lead to skin looking tired and pale. The Lacura Anti-Fatigue Face Mask contains extracts of the fruits most rich in Vitamin C, as well as protective Vitamin E and high quality sea buckthorn oil which is also rich in vitamins. With a special combination of active ingredients, it supports the skin's own natural processes, brightens the complexion and leaves skin looking radiant. How it works: 1. Provides intensive moisture. 2. Has been especially developed to counteract the visual signs of tiredness. 3. Refreshes the skin. Results: Noticeable rapid suppleness. Vitalises. Brightens the complexion for radiant skin." So, that's a whole lot of claims for one face mask, but essentially it boils down to moisturisation and radiance; two things I think most of us are happy to get from our skincare! 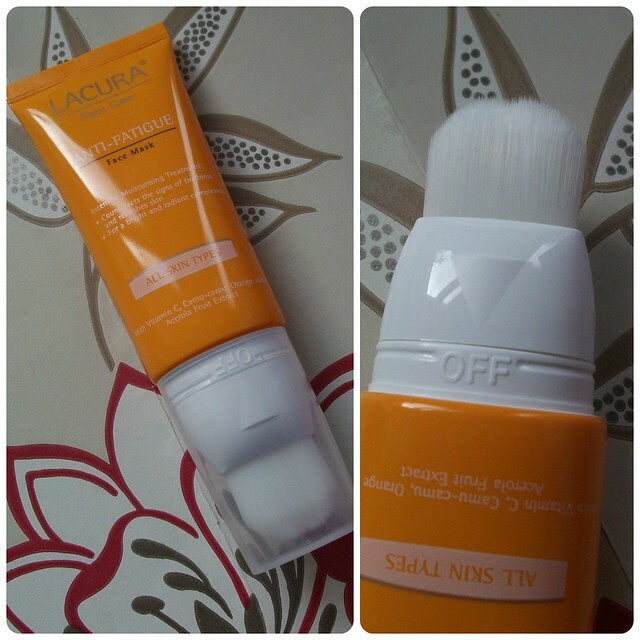 Within the outer cardboard packaging, the face mask is contained within a squeezy plastic tube with a click-off cap; application is via a brush which you twist to unlock, allowing dispensation of the product, then twist again to lock after use. I have to say, this is the best face mask packaging I have ever used, as it makes application so easy and fuss-free; you simply brush the onto the face as directed, then wash the brush out with warm water ready for next time. The mask itself is an orange-yellow gel in colour which smells quite strongly of oranges; personally I found it really pleasant to use and the scent lasts on the skin for the duration of the mask. 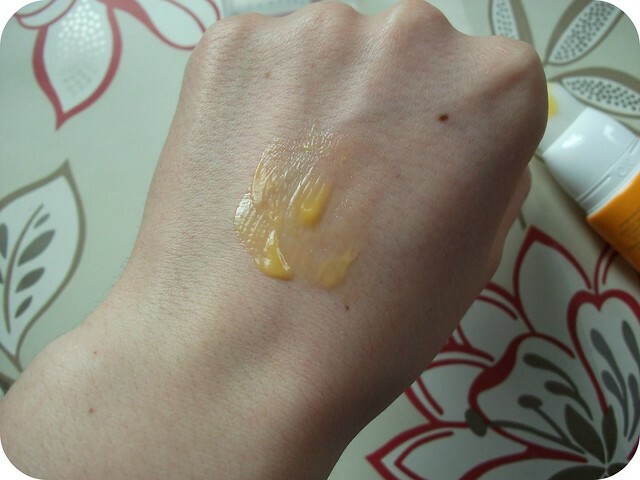 The product doesn't really dry on the skin, rather sitting and remaining sticky and gel-like in texture. I tend to wait 10-15 minutes before washing off with warm water and a face cloth, or rinsing in the shower. I have to agree with all the claims made; my skin really does look brighter, more radiant and less tired after using this mask! My face is left feeling soft, smooth and really well-moisturised, which is lovely. Dry skin isn't really a problem for me but my skin can definitely tend towards dehydration, despite being oily; this mask counteracts that beautifully and I can imagine that if you do struggle with dry skin, this would be just as nice. In all, this has been a wonderful introduction to Lacura's skincare products and has definitely left me wanting to try more from the range! Priced at just £3.99 for 40ml of product, this is an absolute steal and is a product I'd definitely recommend picking up if you spot it in store; as far as I'm aware this is still available in my local Aldi, but their products can change quite frequently, so if you'd like to try it I'd suggest looking sooner rather than later! 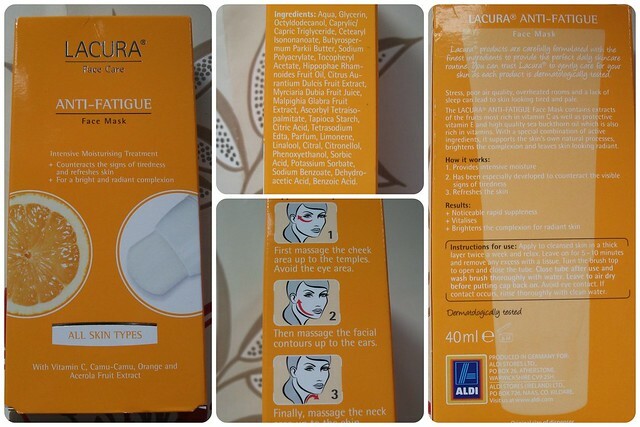 Have you tried any of Lacura's skincare products? What do you think to supermarket brands? Do you like the sound of this face mask? Love how it's packaged, brush is a nifty idea! Think I'll look out for this on my next trip there. This reminds me a lot of REN Glycolactic Radiance Renewal Mask! The packaging is so similar to a liquid highlighter I bought from Revlon a few years ago. I did not know about this brand but the packaging has surely intrigued me!!! I have never been to Aldi and never heard of Lacura, but now I am really curious! I am obsessed with skincare so I want to try this! Oh I have heard of this brand but have never myself tried anything. The product itself reminds me of a No7 highlighter, the design is really similar.